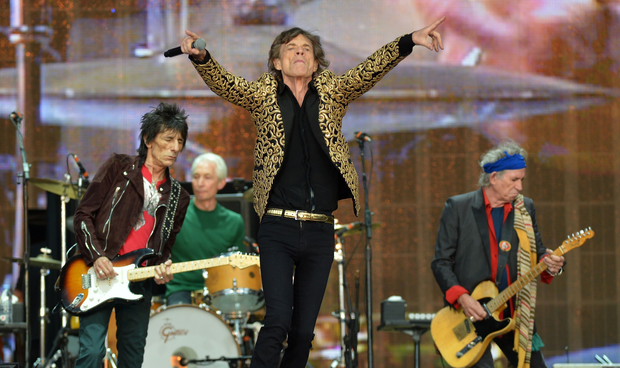 More than 70,000 fans are set to descend on Croke Park this Thursday for the Rolling Stones concert as they kick off the European leg of their No Filter tour. Fans attending the venue have been advised that there are strict measures in place over what they can bring and everyone is encouraged to carry only the essentials with them. Only small A5 size bags will be permitted inside the venue. "The message we want to get across is, help us help yourselves. What the Rolling Stones have is a consistency of how they handle the audiences they are entertaining," said Jim Clarke, Aiken Promotions Event Controller. "That requires us to do things slightly differently. One of the major changes is the size of the bag you can bring. Nothing bigger than what we would term, A5. Half an A4 sheet. It's quite small, a small novel. "Enough to bring the essentials of life. Telephone, credit cards, money. Any cameras, no more than a small camera that would fit into that." The gates of Croke Park will open at 5pm on Thursday, May 17 and attendees are advised that early queuing on the streets around the stadium is not permitted. The opening act, The Academic, will be on stage at 7pm followed by the Rolling Stones. Organisers are expecting the weather to be pleasant for the duration of the concert and attendees are reminded that umbrellas are not allowed inside the venue. There are a limited number of tickets still available for purchase and fans are advised to only buy tickets from Ticketmaster outlets to avoid purchasing counterfeit tickets. "Anyone buying a ticket should have a tremendous view of the stage. There are lots of areas where there may be some seats available and the website will tell you exactly where they are available," said Mr Clarke. Attendees are also strongly advised to avail of public transport on their way to Croke Park if possible. Those looking for advice on how to plan their journey can find more information on crokepark.ie/getting-here. There will be security present during the concert to ensure the event runs smoothly. "Suffice to say, we have a robust police presence in the stadium. We have different components of our plan that will address any risks that might be present," said Inspector Tony Gallagher of Mountjoy Garda Station. Under 16s attending the concert must be accompanied by a parent or guardian while under 14s are not allowed on the pitch under any circumstances. Mr Clarke said that all going to plan, the concert will be a night to remember for all. "The big picture is that the Rolling Stones are coming to Dublin and it is going to be a tremendous night. We are looking forward to a great night here at Croke Park," said Mr Clarke. The latest details for the event can be found on www.aikenpromotions.com, www.ticketmaster.ie, www.crokepark.ie and www.garda.ie. Read more: Was Exile on Main St the Rolling Stones greatest ever album? Was Exile on Main St the Rolling Stones greatest ever album?